This Labor Day weekend, All American Clothing Co. is having their annual ‘A Labor Day, Made in the USA’ sales event. The sale will take place Thursday, August 29 through Monday, September 2nd. The 'Labor Day: Made in the USA' sale starts today! Founded in 2002 by Lawson & BJ Nickol after a previous employer started outsourcing, the father and son team started the All American Clothing Co – a company that vows to never trade USA jobs for foreign profits. All American Clothing Co, one of the leading providers of high quality USA Made clothing is offering the opportunity for Labor Day shoppers to support American jobs with an extraordinary value. Typically, All American shoppers will earn free shipping on all orders of $99 or more. However, this Labor Day weekend the company is offering USA made shoppers the opportunity to earn free shipping for half that amount on orders of $50 or more. “Our Labor Day, Made in the USA sale is perfect for those looking to support American workers. By doing so, more jobs can be created which in turn, will allow more Americans to enjoy more Labor Days to come,” commented Logan Beam, Spokesman of All American Clothing Co. 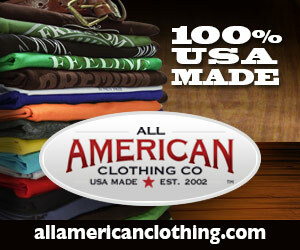 The All American Clothing Co. insists on carrying only American made clothing items and accessories. The company is best known for their unique traceability technology, which supports over 12,000 American workers. It allows shoppers to trace their All American Jeans throughout the production process. Shoppers can even learn about American farmers who grew the cotton used in their jeans. Traceability Technology truly makes an American made shopping experience. It is exclusively found with the All American Clothing Co. Founded in 2002 by Lawson & BJ Nickol after a previous employer started outsourcing, the father and son team started the All American Clothing Co – A company that vows to never trade USA jobs for foreign profits. The company continues to create jobs in a clothing industry that has lost 84% of its labor force since 1990, according to the United States Bureau of Labor Statistics. The USA made clothing company has been featured on ABC World News with Diane Sawyer, CNN Living, Huffington Post, Fox Business, CNBC, Sirius XM, Forbes, Inc., and many more for their efforts. 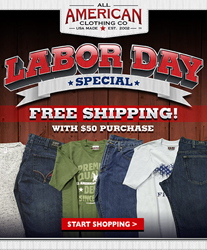 For more information about All American Clothing Co. and its Labor Day: Made in the USA sale, please visit http://www.allamericanclothing.com or call customer service at 888.937.8009. Customer service hours are Monday – Friday from 9:00 AM to 5:00 PM EST.